LIMITED EDITION CORNER LOT HOME with no neighbors behind! 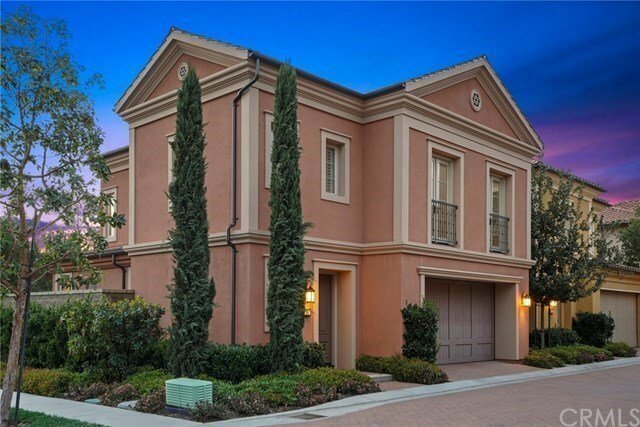 Discover refined luxury in Southern California’s centrally located guard-gated Irvine destination, Laguna Altura—Our PRIVATE Siena Collection Residence 3 “Classical” presented by Irvine Pacific features 3BD 2.5BA and approx. 1868 Sq. Ft of upscale interior indulgence! The home offers signature features at every turn including Berkshire “Hickory” Hardwood Flooring, Built-In Surround Sound in EVERY Room, Deluxe Custom Fitted Plantation Shutters & Hunter Douglas Window Shades, Maple Remington Cabinetry with Soft-Close Hardwood Drawers, Crown Molding, and Recessed Lighting! Chef-inspired gourmet kitchen with Granite Countertops & Backsplash, Maple Cabinetry, Expansive Kitchen Island with Upgraded Clear Glass Doors and Posts, and ALL Stainless Steel KitchenAid/Whirlpool Appliances! A lifestyle opportunity for outdoor living—Ceiling Fan with Light, Custom Stone Pavers, and Professional Landscaping! Enjoy world-class amenities exclusive to residents --parks, full court basketball, junior olympic pool, spa, clubroom, and BBQ picnic destinations. Award-winning Irvine unified school district (zoned University High), and just minutes from dining destinations at the Irvine Spectrum Center, Quail Hill Shopping Center, Los Olivos Shopping Center, John Wayne Airport, Kaiser Permanente, Hoag Hospital, Laguna Beach, and connecting freeways (I-405, I-5, 133, 73, & 261)!